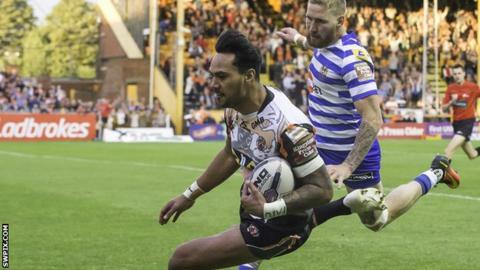 Denny Solomona scored a hat-trick of tries as Castleford prevented Wigan from going level on points with Hull FC at the top of Super League. The Warriors remain two points behind leaders Hull and will drop to third if Warrington beat Wakefield on Sunday. Winger Solomona and Paul McShane touched down to give the hosts a 12-6 lead at half-time, Sam Powell replying. Two more Solomona scores after the interval helped to seal victory, despite Wigan threatening a comeback. Ben Flower sandwiched Solomona's second-half brace and the Warriors reduced a 14-point deficit to four points when John Bateman and Lee Mossop both crossed. But their hopes of an unlikely win were thwarted by last-gasp efforts by Ryan Hampshire and Oliver Holmes for the Tigers. Solomona took his tally of Super League tries in 2016 to 31 and the winger is well clear in the race to be the division's leading scorer, with his closest challenger - Corey Thompson of Widnes - second on the list with 20. Replacements: Jewitt, McShane, Cook, Millington. Wigan: Tomkins; Charnley, Gelling, Sarginson, Manfredi; Williams, Smith; Crosby, Powell, Flower, Bateman, Isa, Sutton. Replacements: Farrell, Mossop, Tautai, Nuuausala.